Like Allen Iverson driving to TGI Fridays on half-off double margs night, I am beyond excited. The 76ers are BACK BABY and hold more promise than any other year that I can remember. Sure, we were excited for the 2001-2002 season after their improbable run to the finals, but Derrick Coleman and Vonteego Cummings don’t quite move the needle for me like a healthy Markelle Fultz and a no-time-restrictions Joel Embiid. It’s a NEW SEASON and it calls for BOLD TAKES from the media to desperately top themselves after a year of mystery injuries, burner accounts, and one of the most entertaining seasons of basketball we’ve seen in nearly two decades. So here it is. FIFTY BOLD PREDICTIONS in no particular order for the upcoming 2018-2019 Philadelphia 76ers season. The 76ers will lose tonight to the Celtics by double digits. Markelle Fultz will score 12 points tonight on 4 for 12 shooting, have four rebounds, three turnovers, two steals and a block. Ben Simmons will NOT attempt a jump shot of more than 15-feet to the delight of the Boston crowd. The 76ers broadcast will have to censor out more than 10 racial slurs lobbed Joel Embiid’s way from the delightful Boston fans after a thunderous breakaway dunk. After the loss tonight, Anthony Gargano will panic and change his preseason prediction of 75 wins to 74. The 76ers will be 11-4 after 15 games. JJ Reddick will average a career high in points scored this season. Embiid will play between 73 to 75 games. Embiid will SNIFF 30 pts and 10 rebounds on the year. Both Embiid and Simmons will be MVP finalists. Fultz will average 13.5 points, 5 assists, and a steal a night on the year. Fultz will make 35 threes. In his Philly Voice column, Angelo Cataldi will predict an 8th seed playoff spots for the Sixers and a first round playoff exit to the Celtics. In South Jersey Magazine column, Cataldi will predict a 2nd seed playoff spot and an Eastern Conference Finals trip where the 76ers lose to the Cavs and LeBron James. Cataldi will claim on the WIP Morning show he knew James wasn’t on the Cavs and was making a satirical point in his South Jersey Magazine column. Cataldi will forget the mics are on and reveal he had no clue James was no longer on the Cavs and would be heard asking Rhea Hughes if he had signed with the 76ers. Cataldi would again claim he was joking. Robert Covington will shoot 40% from beyond the arc this year. Covington will shoot about 10% on contested layups this season. Covington will lead the team in steals. Covington being a top-50 players in the NBA will lead to the most arguments on 76ers Twitter. T.J. McConnell will lead the team in grit, hustle, gritty hustle, hustle plays, dives for loose balls, and hair gel for the fourth season in a row. Spike Eskin will pleasure himself to a clip on Twitter of McConnell making a chase down block this season. Howard Eskin will declare Embiid a bust at some point during the year. Mike Muscala will quickly become a fan favorite in Philadelphia. His dad will not, but he’ll be incredibly popular among Bostons fans. Matthew Berry will sue the Coggin Toboggan after reading this column. Berry will drop the lawsuit after he sees the hilariously depressing way in which the Coggin Toboggan CEO lives his life. Gargano will declare the 76ers championship bound at the halfway mark. Embiid and Simmons will be all-stars. Gargano will declare the 76ers “frauds” after they come out flat in the second half of the year. Dario Saric will have career lows in scoring and shooting. Saric will set a career high in assists. Wilson Chandler will have an injury riddled year. Either Marco Belinelli or Ersan Ilyasova will be re-acquired by the team. Bryan Colangelo will attempt to enter the Wells Fargo Center for a game wearing glasses and a fake mustache. He will be promptly ejected. Reddick will win the NBA 6th Man of the Year Award. Fultz will win most improved. Marc Zumoff will declare “YESSSSSSSSS!” more times this season than ever before. Alaa Abdelnaby will continue to warm the cockles of our hearts. Serena Winters will make fans quickly forget about Molly Sullivan. Brown will again not win Coach of the Year. Simmons will not attempt a legitimate three all year. Embiid will be an NBA MVP finalist. He will not win. The 76ers will finish the regular season with a record of 57-25. The 76ers will be the second seed in the East. The 76ers will defeat the Cavs in the first round of the playoffs. The 76ers will defeat the Bucks in the second round. The 76ers will lose in the Eastern Conference Finals to the Celtics in 7 games. Why even watch the games now? Sorry for ruining the season for you. Try to act surprise when it all comes true. 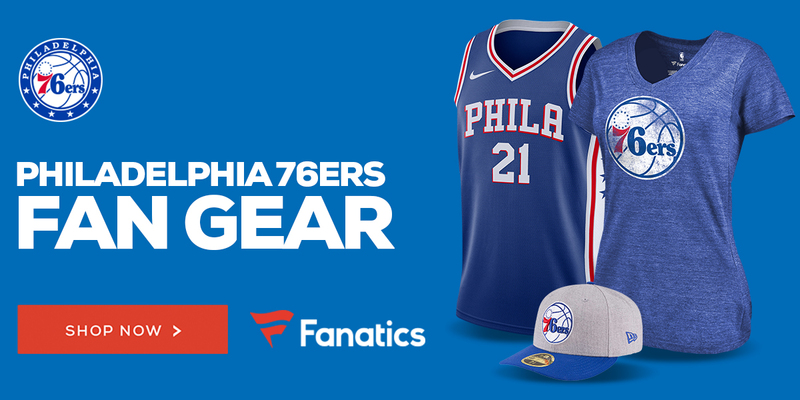 Buy 76ers gear from our good friends at The Fanatics by clicking through the banner below. Each sale gives the Coggin a little taste and helps the Coggin Toboggan CEO live a less depressing existence.